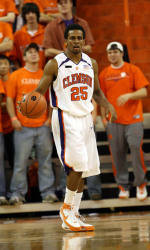  Tuesday night will be a homecoming for Clemson senior Cliff Hammonds. His hometown of Cairo, GA is about 30 minutes from Tallahassee. Last year his family and friends watched him score the game-winning basket with 2.8 seconds left in Clemson’s 68-66 victory. Clemson is 2-1 at Florida State in his career.  Hammonds will be one of three Clemson student-athletes to receive an ACC postgraduate scholarship when the ACC has its academic awards banquet in April. He was recently named to the CoSIDA Academic All-District team and is an academic All-America candidate.  Clemson is looking for its eighth ACC win of the year. An eighth league win would assure Clemson of at least a break even season in the ACC, something it has not done since 1996-97 when the Tigers were 9-7. Clemson has finished with a .500 or better league record just 10 times in its previous 54 years in the ACC.  A win on Tuesday would give Clemson 20 overall wins for the season. It would be the second straight year Clemson reached at least 20 wins. Clemson has had back to back 20 win seasons just one other time in its history, 1979-80 when Clemson was 23-9 and 1980-81 when Clemson was 20-11.  K.C. Rivers led Clemson in scoring in the win at NC State with 17 points, including 15 in the second half. He scored five points in the last two minutes to key the win. Rivers is now 33-63 from three-point range in ACC play, a league best .524.  James Mays, who got a homecoming win in Raleigh on Saturday, leads the ACC in offensive rebounds per game in league play with 45 in 11 games.  Hammonds scored just nine points at NC State, but he is still averaging 18.4 points per game over the last five games. He has made 38 of his last 67 shots from the field, including 13-25 three-point shots.  Clemson has had a double digit halftime lead in each of its last four games.  As a team, Clemson has made 44 of 90 three-point shots over the last four games, a 49 percent clip. It has held the opposition to 18-65 on three-point shots for a .277 figure.  Clemson has committed just 19 turnovers in its last two games, including just eight at N.C. State. It was the low turnover total in a game by the Tigers all year.  Cliff Hammonds will tie Greg Buckner’s Clemson record for consecutive games started when he makes his 122nd straight start at Florida State on Tuesday. He needs just 16 minutes played to become the third Clemson player in history to play 4000 minutes in a career.  James Mays will play his 100th game on Tuesday.